What makes Jennifer Rosen Meade Preschool a special place to send my child? 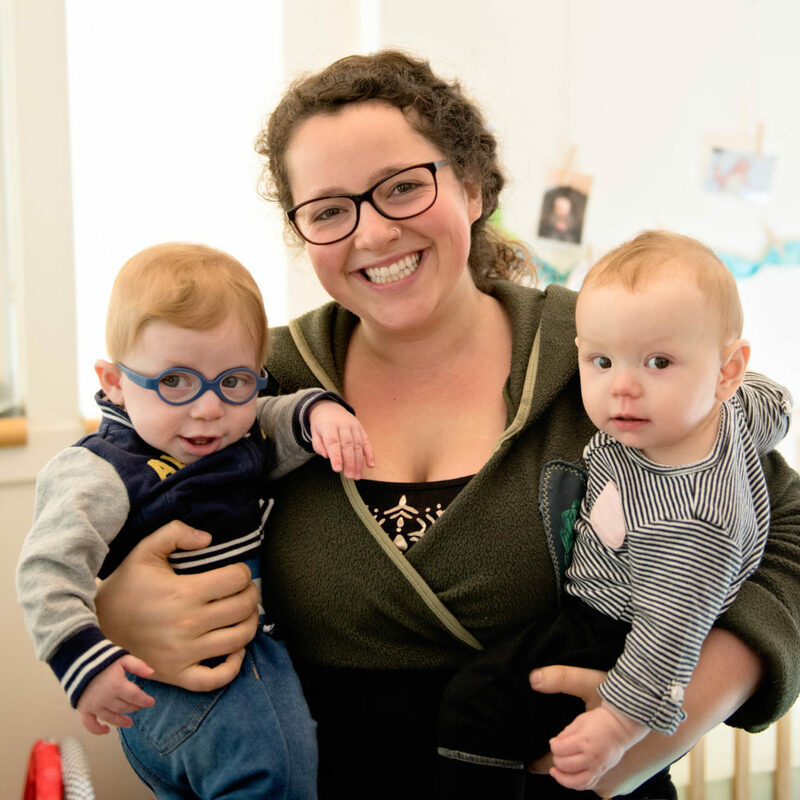 At Jennifer Rosen Meade Preschool, we nourish your child’s growth and engage them in experiential learning enriched by a unique blend of Jewish values, serving the whole family and making us all feel connected within the warm embrace of a Reform synagogue community. 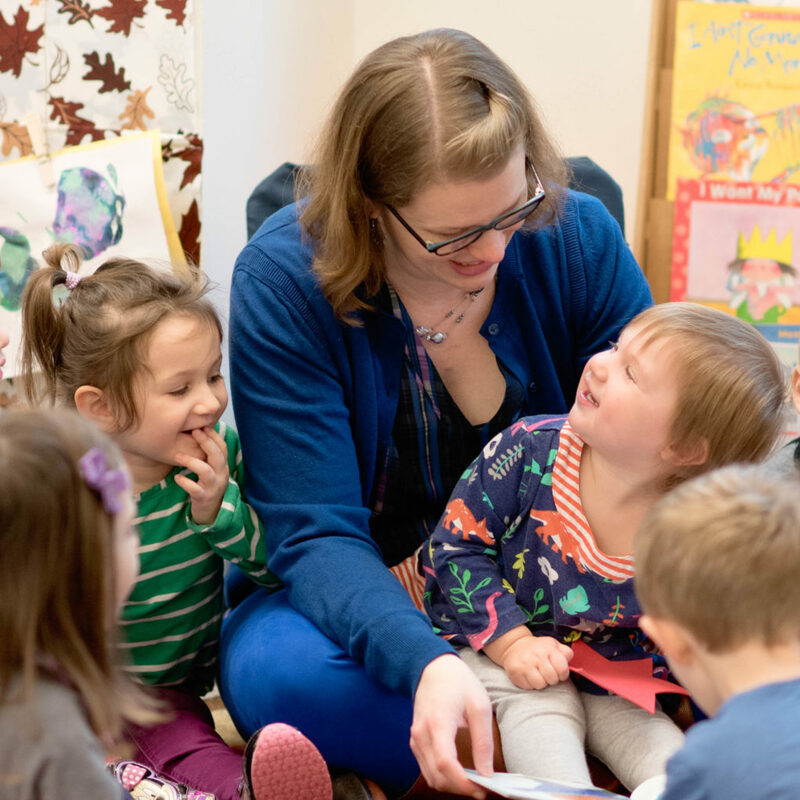 Our premier secular learning opportunities regularly put us at the top of our parents’ minds as one of the best Seattle preschools, best Bellevue preschools, and the best Jewish preschools. Our teachers support and encourage children to acquire knowledge through child-centered discovery, exploration, creative thinking and problem-solving, and nurture a strong foundation for a life-long love of learning. We use our beautiful wooded setting to bring the outdoors in and the indoors out every day. Ask our parents and you’ll quickly hear about how much their children love joining their friends in the classroom for an exciting and developmentally in-tune educational experience. We draw on a broad range of proven educational methods and programs, including not only math, science, art, language and literacy, but also movement, cooking, creative thinking, and music, all with integrated Judaics. We educate the whole child and nurture their body, mind and spirit. Do you offer a kindergarten preparation program? 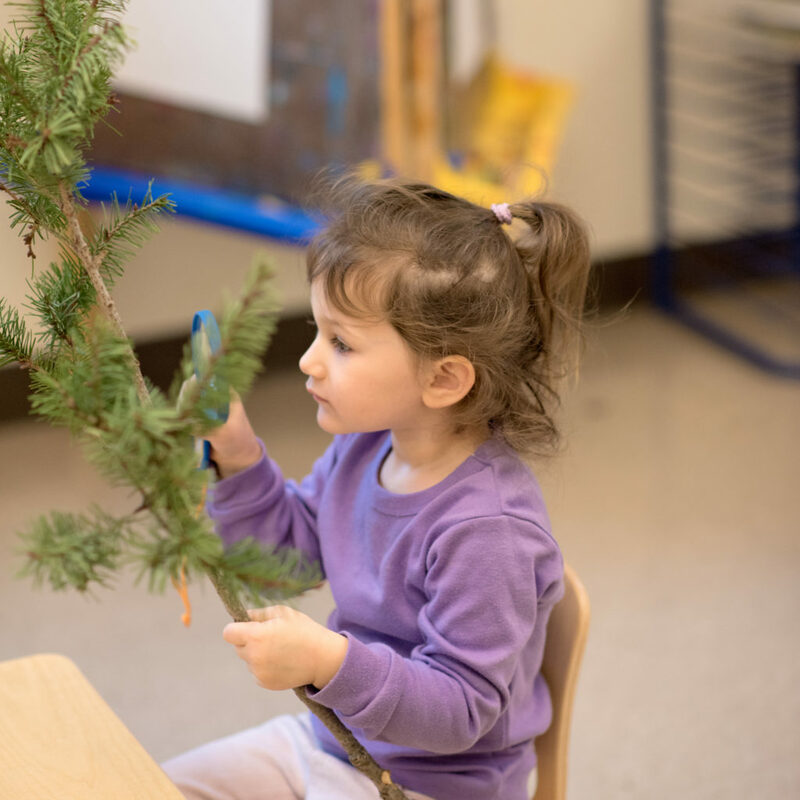 To ensure our program continues to be a top Jewish preschool in the Bellevue and greater Seattle area, we continually evolve with an innovative, child-centered curriculum in a warm, supportive, Reform Jewish environment. Your child can develop confidence, critical thinking skills and a lifelong love of learning that will prepare him or her for kindergarten and beyond! We use Teaching Strategies Gold for our developmental assessment to ensure we are providing age-appropriate activities for our children. Washington State adopted this tool for establishing Kindergarten readiness standards. To find out more about our programs, click here. Find out if your family and Jennifer Rosen Meade Preschool are a great match — reach out to us at (425) 559-2571 or ssolomon@tdhs-nw.org. Do you offer Jewish education programs for my infant and toddler? Your child can start on a pathway of self-discovery through our Yad B’Yad programs. Enroll at JRM Preschool and begin building their love of learning and the confidence to tackle any challenge. We offer specially created programs for birth to two-years old designed to build in complexity as your child’s mind and curiosity blossom. Our PEPS, Kisses & Knishes, and Bagels & Blocks programs create an environment where adults work with both their child and a facilitator to enhance overall development. As a Reform Jewish community, we provide ample opportunities for parents, grandparents, and loved ones to learn and explore with your child, from Shabbat, to Jewish holidays, to other fun activities designed to strengthen our children’s ties to our heritage. What days and times are your programs available? 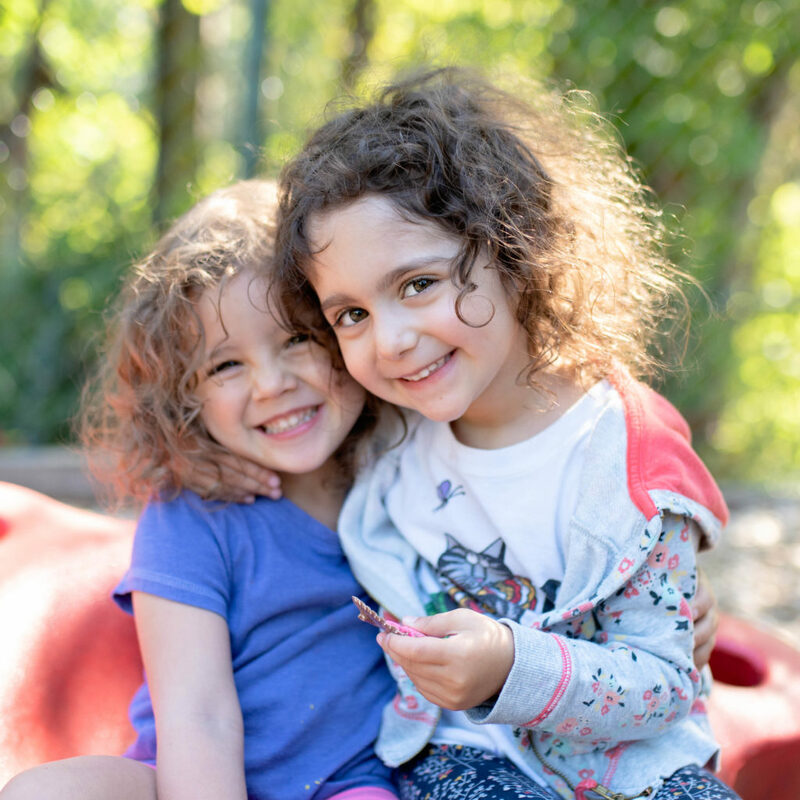 As a family-centered Jewish preschool, we understand that you and your child have specific needs, and we meet those needs with one of the most flexible schedules of any preschool in the Bellevue area. Our programs start with not only full-time care for working families, but also caregiver and child classes for infants and toddlers. We offer families flexibility, with part-time, full-time and extended care options. How do I know my child is safe and well cared for? JRM Preschool values your child’s safety and provides security features at our Bellevue campus that include staff training, security cameras, a gated parking lot entry and a security guard. Our procedures provide an additional level of safety and security, as we carefully control release of children as well as who has access to the facility. Our staff’s unwavering dedication is reflected in our extraordinarily low turnover rates. Teachers are STARS certified, bring years of experience to the classroom and commit to continued, advanced training throughout the year. Health, safety, and emergency preparedness trainings are provided annually to the staff. At Jennifer Rosen Meade Preschool, your child’s imagination and individuality are encouraged, not stifled. We pride ourselves on our preschool being a place where your child feels comfortable building the confidence that supports a lifetime of learning. We recognize that every child grows and learns at his or her own pace, so we provide customized curriculum to meet individual needs, using Teaching Strategies Gold & Creative as a basis for curriculum, daily schedule, lesson plans and individual child development. We don’t believe that education should be one-size-fits all, so our skilled teachers draw from different educational theories and curricula, bringing the best of each to the classroom. Our staff create an environment that nurtures your whole child: body, mind, and soul. We update you regularly, as we think of your child’s educational experience as a collaboration and encourage you to ask questions and voice concerns at any time. How is Judaism incorporated into the classrooms? 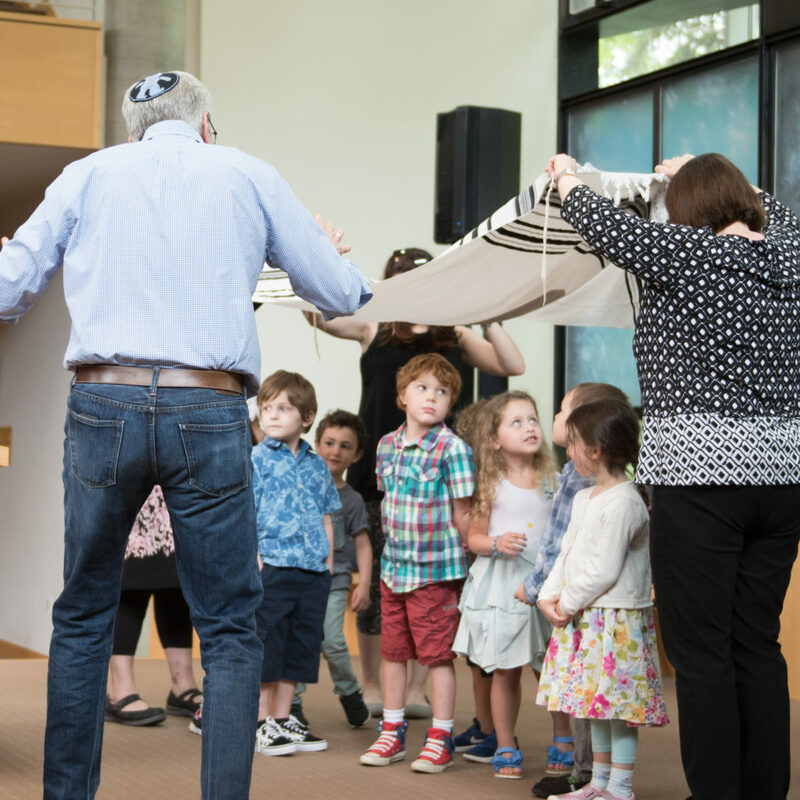 Our synagogue-based program encourages families to connect with Temple on an ongoing basis. Our program is distinct from others in that it offers a unique bond with a synagogue, the historic center of Jewish life. Opportunities to visit the sanctuary, interact with rabbis, and experience Jewish holidays enrich our program. As a Reform Jewish preschool, our rabbis are an integral part of our teaching team, celebrating Shabbat with us weekly, as are our specialists. Our rabbis and specialists infuse Jewish traditions, melodies and warmth into our school life. Some of our values, like Kavod(respect for self, others and community) and tikkun olam (repairing the world), are values incorporated into our daily programing. Children are exposed to basic Hebrew language as well as Jewish rituals and blessings. Families – including, of course, parents, siblings, grandparents and extended family – are invited to join us weekly for Tot Shabbat on Friday mornings starting at 10:00 AM. 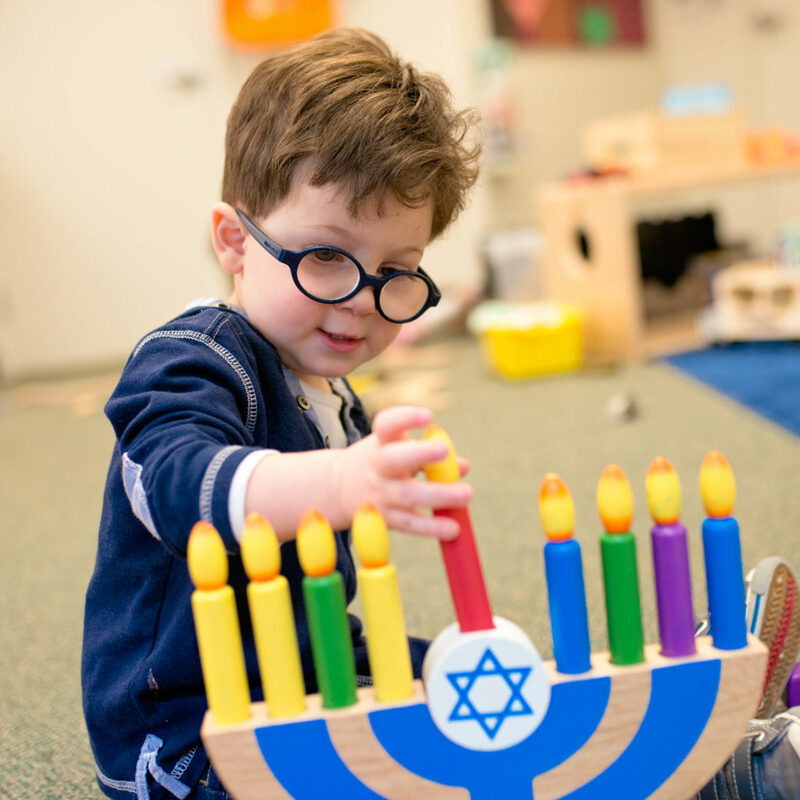 While JRM Preschool is a Reform Jewish preschool, we welcome those with all levels of observance, as well as families from other faith traditions. For parents with no or little knowledge of Judaism, we share information to keep you up-to-date on what your child is learning. Do you offer a secure, outdoor play area? We bring the outdoors in and the indoors out every day. We believe that outdoor play is essential for building the physical, motor and social skills your child needs to thrive. 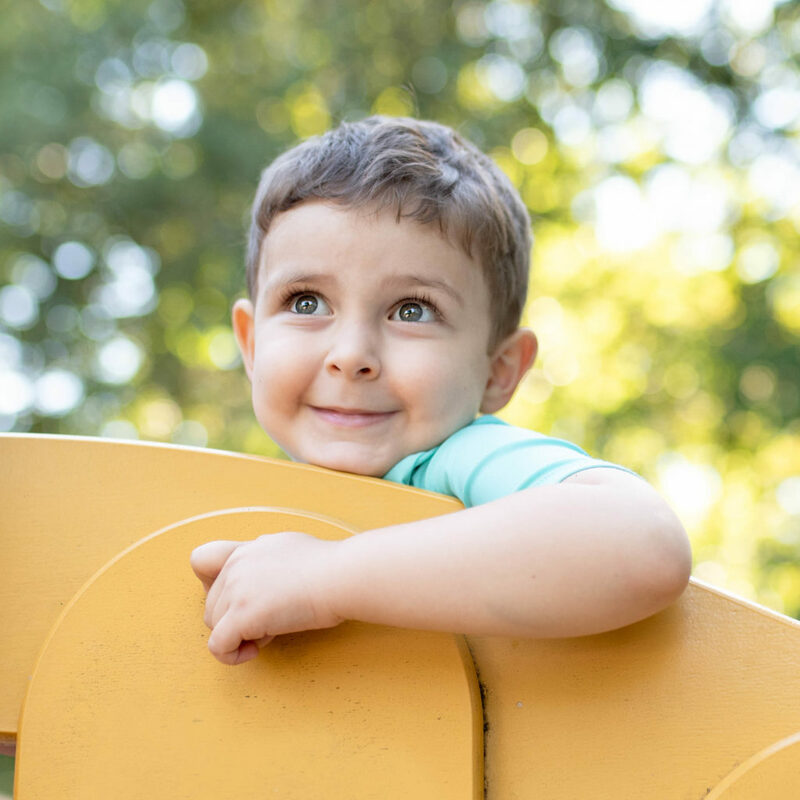 We offer a specially designed, fully fenced play area, surrounded by lush, protected woodlands, and plenty of grassy areas to run: exactly what your child needs to spark their imagination! We experience the outdoors in all types of weather and we ask that children have appropriate clothing. If we are unable to go outdoors for any reason, we have a spacious indoor facility that allows children to explore and use both fine and gross motor skills. How do we partner to ensure my child is successfully prepared for school and life? You’ve been there for every scrape, bump, boo-boo and temper tantrum. Now it’s time to let your baby go, just a little, so they can begin building the confidence they need to explore the world around them. That is why we put extensive care into designing our classrooms, choosing teachers who feel like a natural extension of your family, and providing the Reform Jewish education that aligns with your values. Beyond that, we believe ensuring you get what you want from your child’s preschool experience begins by listening to the person with the deepest understanding of what they need: you! We encourage you to reach out, at any time, with comments, questions, concerns and even funny stories about your child, because the only way your child can grow up the way you want is for us to work together. Daily two-way communication is invaluable as we embark on this adventure together. Twice a year, family conferences are held to discuss your child’s development and goals. We use a web and mobile app-based program, “Remini,” which makes daily sharing of information and photos easy! 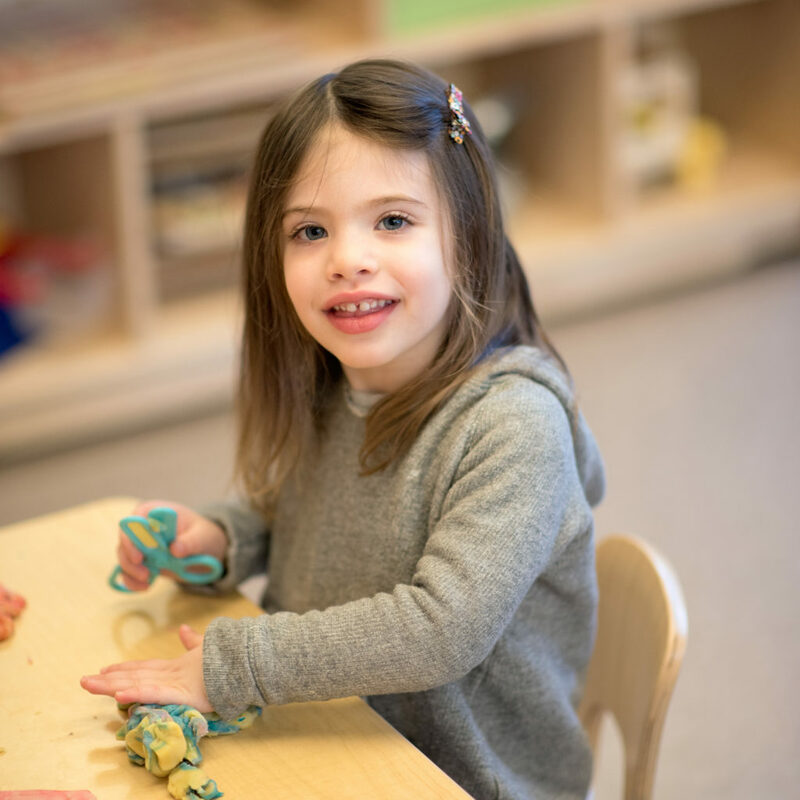 Alumni, parents and our Jewish community generously donate to ensure that ability to pay is not a barrier to giving your child the best education imaginable. If financial assistance would allow you to join us at Jennifer Rosen Meade Preschool, we would love to help. Click here to learn about scholarship opportunities available to your family. Can we see you in action before we commit? 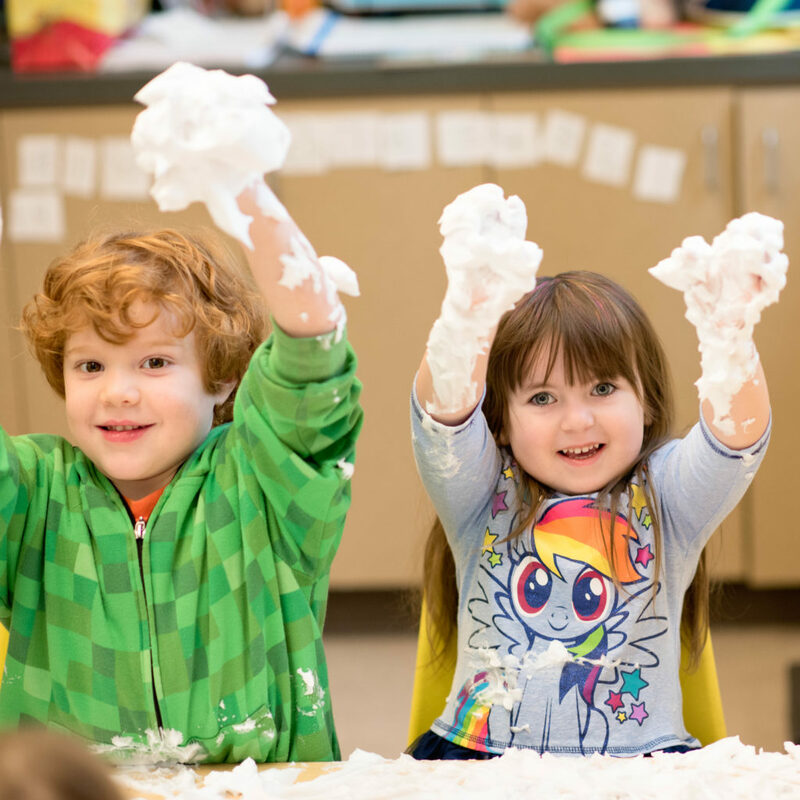 If you’re seeking that special environment where your growing baby can laugh, discover, and develop a lifetime love of learning, we welcome your family to come explore Jennifer Rosen Meade Preschool. You can sit in on classes, meet our teachers, and discover how we can work together to make JRM Preschool the ideal “home away from home” for your little explorer. 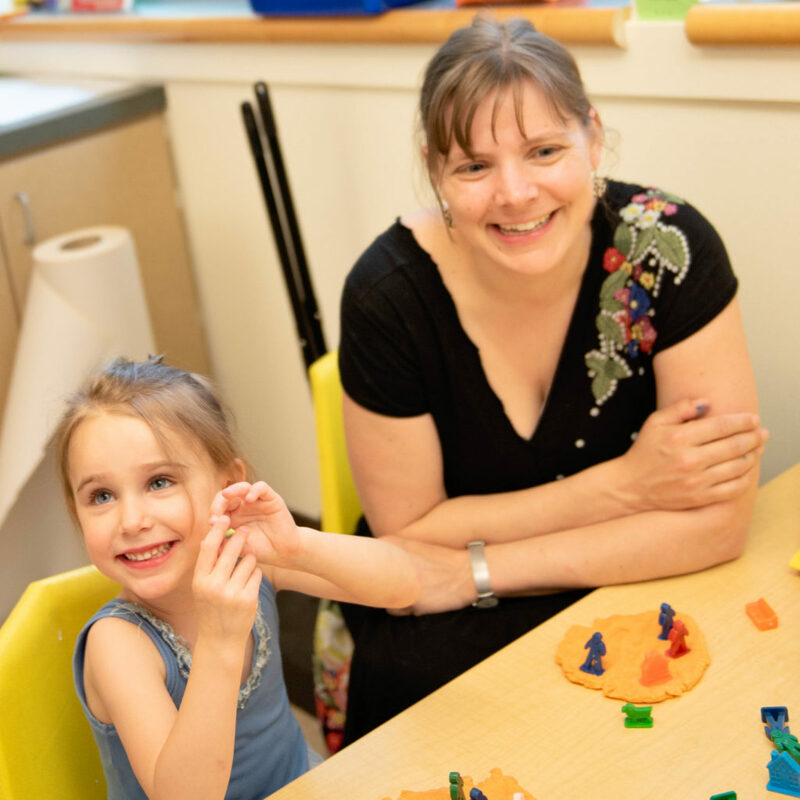 Simply reach out to JRM Preschool Early Childhood Education Director, Shannon Solomon, to schedule a time to visit at (425) 559-2571 or ssolomon@tdhs-nw.org.